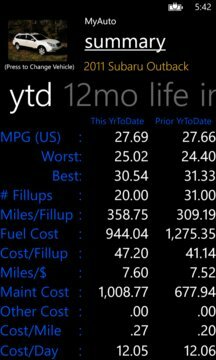 Not only lets you track fuel efficiency and auto costs, but you can also schedule and track your future maintenance, like oil changes, tire rotations, etc. 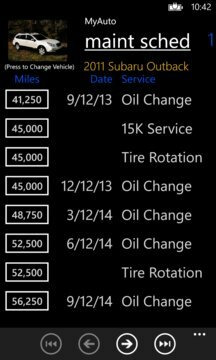 MyAuto will warn you when your next maintenance is due. -Price includes all features, comparable to other 'pro' versions. -Generates service schedule out to the next 50,000 miles. -Trial mode is full featured, but allows 1 vehicle and 10 fuel receipts. -Track costs by the categories that you specify. -Use camera to keep warranty and maintenance receipts. -All entries are fully editable from history. -Backup and restore data to either SkyDrive or Dropbox. -Create Wide Live Tiles by vehicle and function. -Easy entry of fuel and maintenance costs. -Enter multiple services on one maint receipt. -Calculate planned trip fuel costs using historical fuel rates. -Uses GPS to fill fuel stop location names on subsequent visits.